Valeriano Fatica is an Italian sculptor who works mostly in the medium of food. His creations include various gourd demons and Jesus crafted out of hard cheese. His latest sculpture, though, may be his most successful yet. 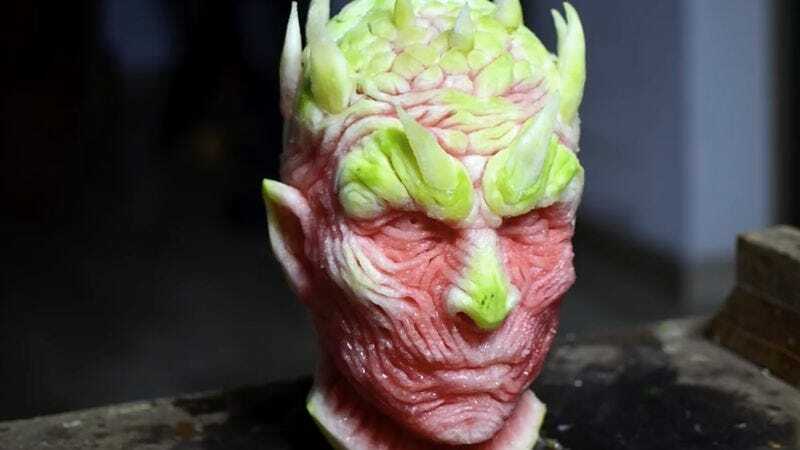 Fatica has taken a watermelon and turned it into the Night’s King, leader of Game Of Thrones’ much feared army of the undead, The White Walkers. The sculpture took 18 hours and is stunningly detailed. The face of evil has never looked so juicy. If you want to watch how one turns a watermelon into a zombie overlord, here’s a fast-motion video that breaks it down.